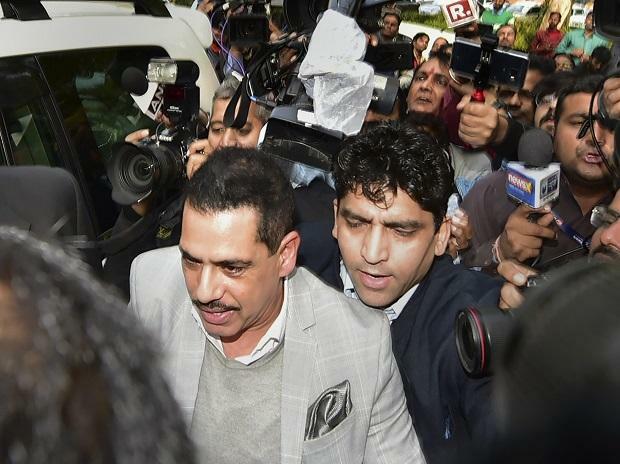 The Enforcement Directorate (ED) on Friday said it has attached assets worth Rs 4.62 crore of a firm linked to Robert Vadra, Congress president Rahul Gandhi's brother-in-law, in connection with the Bikaner land scam money laundering case. "The attached assets include movable assets amounting to Rs 18,59,500 pertaining to four individuals and one immovable property situated at 268, Sukhdev Vihar in New Delhi to the extent of Rs 4,43,36,550 owned by Robert Vadra's company Ms Sky Light Hospitality (P) Ltd (now LLP)," the agency said. The ED issued a provisional order for attachment under the Prevention of Money Laundering Act (PMLA). It had grilled Vadra in this case in Jaipur twice last week. His mother Maureen was also asked to depose but was allowed to go after completion of brief legal procedures. The ED had registered a criminal case in connection with the deal in 2015, taking cognisance of a clutch of FIRs and charge sheets filed by Rajasthan Police after the tehsildar of Bikaner complained about alleged forgery in the allotment of land in the area, considered sensitive due to its proximity to the Indo-Pak border. Probe revealed, the ED said, that the central government had acquired land of as many as 34 villages in Bikaner district for the purpose of establishment of Mahajan Field Firing Range (MFFR) and the state government proposed for rehabilitation of the displaced people by providing land equivalent to their acquired land. "Fraudster Jai Prakash Bagrwa and others in collusion with state government officials got 1,422 bigha government land illegally allotted to fictitious persons in guise of a government scheme for people displaced due to establishment of MFFR and illegally sold 1,372 bigha out of this land to various persons and companies," it said. On detection of fraud, impugned land was recorded back as government land in revenue records by Rajasthan great, the ED said. Subsequently, it said, these impugned fraudulent lands were further sold by subsequent purchasers to individuals and companies and all these subsequent sellers of the impugned land generated a considerable amount of profit. "These fraudulently generated profit by these entities is nothing but proceeds of crime as defined under the PMLA and Vadra's company Sky Light Hospitality (P) Ltd had purchased 275 Bigha (69.55 hectare) fraudulent land for Rs 72 lakh and sold the same for Rs 5.15 crore to Allegeny Finlease (P) Ltd and illegally generated profit of Rs 4.43 crore," he said. Four other individuals had also generated profit of Rs 18.59 lakh in sale of impugned fraudulent land, it said. The ED has filed charge sheet in this case against 9 accused and the total attachment in this case stands at Rs 6.44 crore now.